This cumbersomely-titled print is from Dürer’s Apocalypse series and references two different moments witnessed and written by St. John in the Book of Revelation. Spotting these two scenes is fairly simple: Dürer certainly wanted the viewer to notice St. John (the slightly bent figure in the top right corner) being shown the New Jerusalem by an angel (directing the viewer’s eye to the aforementioned city, thus identifying this figure group and “telling a story” through gestures in the image). Several visual elements lead our eye towards these two, including the bright swath of white earth upon which John stands, the directional lines created by the angel’s wings, and the framing elements provided by the trees surrounding the scene. 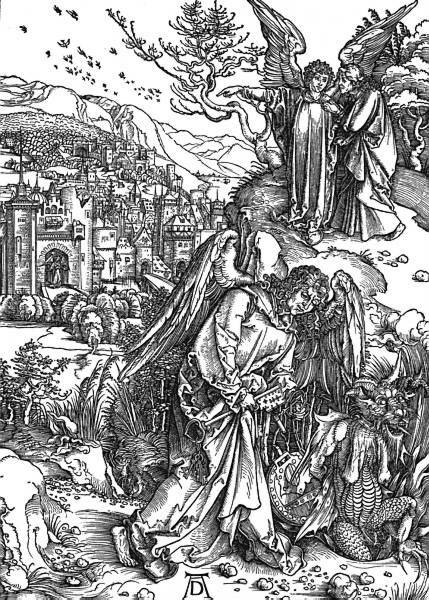 If you look very closely at the New Jerusalem, you can see how Dürer has taken his cues from Revelation, and added the detail of an angel at each of the gates1 (though he did choose to omit certain parts, such as the angel’s gold measuring rod and the other half of the “perfect square” which made up the city’s walls). The other moment played out in this print is the angel securing the dragon/demon in the abyss. Here we see the “enormous chain” St. John describes, with the angel in mid-action as he seals Satan in the pit. Our attention is drawn to this vignette through the use of a few more visual elements, including the balance created by the angel’s right wing and the ominous puff of smoke that emanates from the pit, the contrasting textures of the angel’s feathers and the dragon’s scales, and the relative size of the angel and his placement in the approximate centre of the image. The inclusion of different parts of the same story (called continuous narrative) gave even illiterate people the ability to “read” (visually) and understand this Biblical tale which was very important in Renaissance Europe. This and other Dürer prints will be on view at the McMaster Museum of Art until July 4, 2009.